Test drive finds plenty of power and comfortable ride. Honda's redesigned Foreman is a little bigger and a little stronger than before. It features a new, fuel-injected 475cc liquid-cooled engine with 6% more torque and 10% more horsepower at the rear wheels. While test riding the Foreman at Carolina AdventureWorld near Rock Hill, South Carolina, I found the new power plant to be strong and responsive but never overbearing. It had plenty of low-end torque to do almost all riding on rougher trails in first, second or third gear. Author says his ride of the new Honda Foreman in South Carolina proved the machine has good, controllable power and adequate comfort. I didn't get the chance to pull anything heavy with the Foreman but the strong feel of the engine in all conditions combined with my past experience with ATVs and pulling tells me it should pull any reasonable load it's coupled with. Honda retained the Foreman's five-speed gearbox configuration with automatic clutch which many farmers consider a bullet-proof transmission for work around the farm. In fact, Steve Markofski, Assistant Manager Product Planning, says the U.S.-based redesign team's overarching mission was to keep the Foreman a value-priced workhorse. All the new Foreman models I rode in South Carolina had electric shift buttons on the left-side handlebar. I've used these before on the Ranchers and Foremans and generally like them. I can see advantages over a foot shift with big, muddy boots, for example. The shift buttons are very easy to use but did seem a little slower to pick up quick multiple shifts when compared with a mechanical foot-shifting lever. The Honda redesign team also gave the new Foreman a little wider stance and a little more ground clearance. The new fenders seem to offer really good splash protection in stream crossings and in high-speed dashes through mud puddles. They should serve admirably on the farm. The new rear swing-arm is three inches wider than before for rigidity and more stable tracking on rough ground or in muddy ruts. It now sports a single large shock absorber instead of two. Honda engineers said this new shock is softer at the top of the travel for a more comfortable ride and yet retains plenty of resistance nearer the bottom of travel for work. It has a five-point adjustable spring preload to help when the machine is really loaded. Honda still uses steel racks on the Foreman, which I consider a real plus. The designers remodeled the seat to make it softer and still retain the longevity Honda tries so hard to build into its seats. 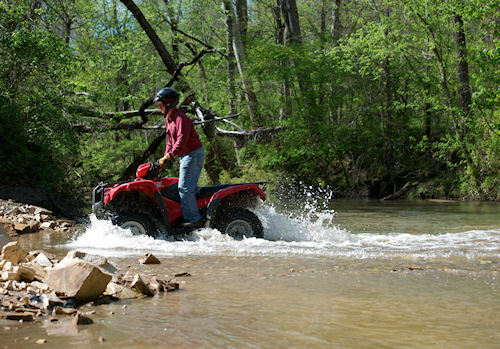 Other additions to the 2012 Foreman include bigger front disk brakes, a new digital control panel and speedometer, a mechanical 2WD/4WD shift lever on the left side of the tank and a Honda line of ATV accessories that includes a Warn winch and mounting kit specifically designed to fit the new Foreman. The new units should be in dealer showrooms by May this year. All in all, my impression of the new Foreman reminds me of a saying from my days judging bird dogs: "All things being equal the winner is the one you want to take home with you." Honda's new 2012 Foreman could go home with me any day.